Samsung has unveiled Ativ Q, a tablet that can switch between the Windows 8 and Android operating systems. The Ativ Q has a 13.3in (33.8cm) screen that sits over a keyboard that can be folded out for typing or set to act as a stand. In addition it has a stylus. 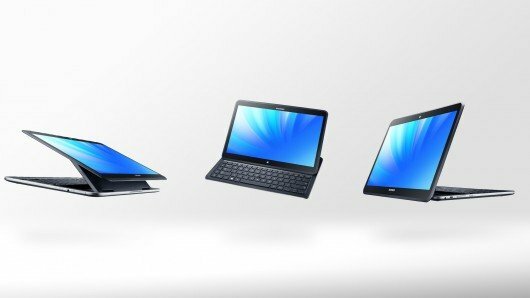 Samsung tablet comes just over a fortnight after Asus unveiled its own laptop-tablet hybrid which also runs both Microsoft and Google’s systems. One analyst said he expected this to be a trend that other firms would follow. “It’s a very cost-effective way for manufacturers to offer extra value to consumers at a time when it’s very hard to differentiate benefits from one device to another,” said Chris Green, principal technology analyst at Davies Murphy Group. The Ativ Q runs off Intel’s new Haswell chip and Samsung said it offered up to nine hours of battery life. It added that the device’s screen had been designed to be bright enough to be used outside on a sunny day. The launch was announced at a press conference in London. Samsung also showed off another touchscreen computer, the Ativ Tab 3 which it described as the world’s thinnest tablet to run the full Windows 8 system, as well as new PCs. Among the other announcements was the Galaxy NX – a camera which allows its lenses to be changed, runs off the Android system and supports 4G data transfers. It marks the firm’s latest attempt to sell a device which offers higher quality images than the typical smartphone, but also allows pictures and video to be edited with apps and uploaded to the internet. It adds to a product line that also includes a handset featuring a 10x optical zoom. “The Galaxy NX camera looks impressive and is more likely to appeal to serious photographers than its S4 Zoom, which is quite a bulky smartphone because of the lens on the back,” said Graeme Neill, deputy editor at Mobile Today. “Samsung’s main difference from its rival Apple is the sheer volume of products it brings to market. The announcements come at a time when the South Korean firm’s stock has come under pressure. Samsung Electronics shares have fallen by nearly 14% since June 4 after a number of banks cut their profit forecasts for the company. They said they were worried its flagship Android device, the Galaxy S4, was not selling as well as they had previously predicted and raised concerns about rising competition from Chinese smart device makers.